Arnold Chacon leads an agency responsible for such high-stakes, far-reaching work as negotiations with Iran to reach a nuclear agreement, opening a new chapter in the United States’ relationship with the Cuban people, combating terrorists linked to ISIS and forging international alliances to mitigate the effects of climate change. Arnold Chacon speaking at the D.C. Boettcher Scholar alumni reception. 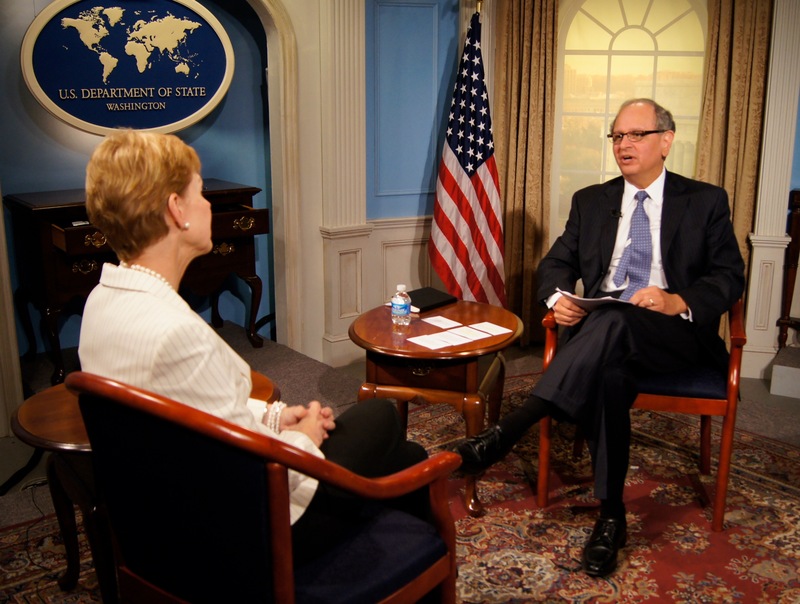 He admits that his early experiences did not necessarily make him a natural for a career in diplomacy, but a love of public service and a desire to give back propelled him to his current role as Director General of the United States Foreign Service. A 1974 Boettcher Scholar, Arnold Chacon has led a life of service ever since he was in college, free to explore his passion for diplomacy without the burden of paying college tuition. A Denver native, Arnold attended North High School and later University of Colorado Boulder, where he was part of the President’s Leadership Class and majored in international studies. “Initially, I believed that the best way to help my community was to become a doctor, hence my seven summers doing volunteer work in Central America providing children with vaccinations and other public health services,” said Arnold. While based in Central America, he worked closely with U.S. development workers and diplomats, which inspired him to consider a new field of study. “I was smitten by the possibility of service abroad, switched my major to international affairs, joined the Foreign Service and found my calling in public service,” said Arnold. As a diplomat, he was posted in Honduras, Chile, Peru, Ecuador, Mexico, Italy and Spain, as well as in the U.S. Mission to the United Nations in New York. His domestic assignments in Washington D.C. included service as Deputy Executive Secretary for Secretary of State Condoleezza Rice. As part of her team, Arnold traveled extensively to the Middle East, Europe and Asia. He also served as the American Ambassador to Guatemala prior to becoming Director General. “Those of us in Foreign Service work to help shape a peaceful, prosperous, just and democratic world. The painstaking work of a diplomat, especially in the current international environment of fear and daunting challenges, is a privilege and high honor,” said Arnold. Though Arnold has a deep-seated service ethic, he would not have predicted his extensive career in government. 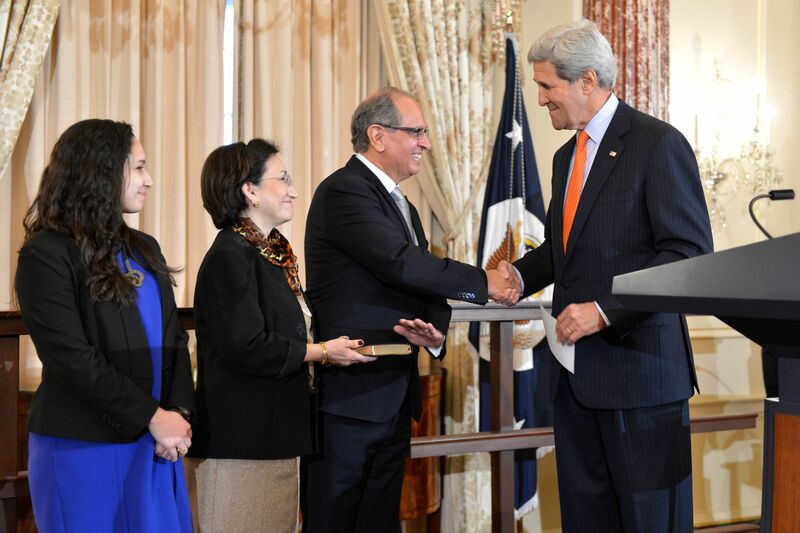 Arnold Chacon with his family and Secretary of State John Kerry. Photo credit: U.S. Department of State. “My family was among the first Spanish and Mexican settlers in Colorado and New Mexico. For generations very few people in my family traveled far from home. Nothing in my background and working class upbringing would have suggested that a diplomatic career was in my future,” said Arnold. His roots are what motivated him to work hard in school, give back to his community and apply for the Boettcher Scholarship. “The Boettcher scholarship allowed me to indulge my passion for international travel and take advantage of volunteer internship opportunities, which would have been difficult if not impossible had I needed to finance my education. The prestige and support inherent in a Boettcher scholarship opened many doors to me as an undergraduate at the University of Colorado, giving me the confidence, mentorship support and leadership skills I needed to succeed academically and professionally,” Arnold said. In his free time, Arnold enjoys gardening, hiking and spending time and traveling with his wife and three children. His wife, originally from Honduras, is also a member of the U.S. Foreign Service. His oldest daughter is an attorney in Silicon Valley, and his younger daughter is helping to develop a new museum at the State Department called the U.S. Diplomacy Center. His son is an economics and philosophy major at the University of Chicago, and plans to go into public service as well. 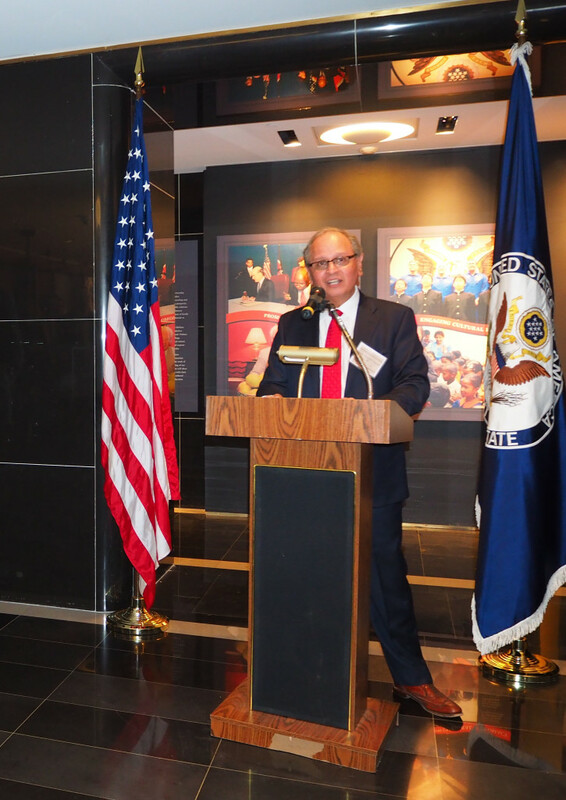 Arnold has been serving his country for nearly four decades, and is still fueled by the same passion that inspired him to join the Foreign Service. “I’m passionate about educating students, especially students from historically underrepresented communities, about the different opportunities in the State Department and at our embassies overseas,” he said. Arnold Chacon at the U.S. Department of State. Photo credit: U.S. Department of State.